The High Priestess (II) tarot card personifies secret knowledge and immobility. 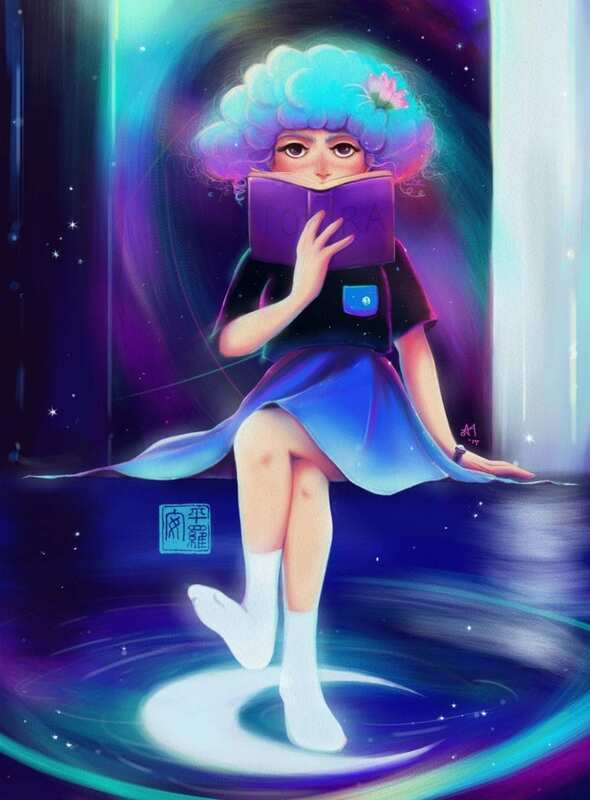 She urges you to trust your gut — the world is full of lies and manipulation, making the ability to see through deceit a most valuable skill to nurture. In the Tarot of Marseille she is know as “La Papesse,” which means female pope. The name “High Priestess” appeared later in the Rider-Waite deck. The card figures a woman in a flowing blue robe. On her head is a horned crown with a white sphere in the middle and by her left foot, the horn of a large yellow lunar crescent reappears. It is said that the crown looks like three stages of the moon: waxing crescent, full moon, and waning crescent. These three moon stages evoke the idealized Triple Goddess: the waxing crescent represents a maiden and symbolizes innocence, the full moon points to motherhood and the “full” expression of womanhood, either via childbearing or gathering of life experience, and the waning crescent signifies the “fading” of the feminine principle. In her left hand she holds a rolled scroll on which is written the letters “TORA”; her right hand and a part of the closed book cannot be seen, signifying the hidden or secret meaning of things. There is a large equal-armed white cross on the front of her robe. Unlike the Christian cross with its longer vertical beam representing tension and psychological angst, this cross is associated with psychological equilibrium, peace and well-being. 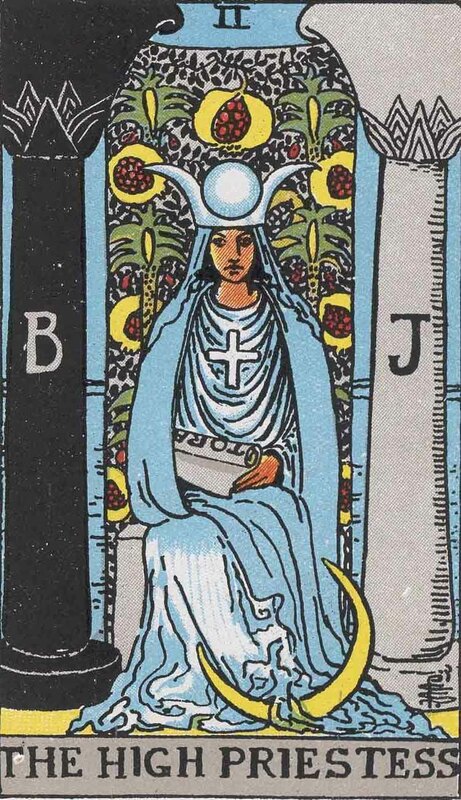 The High Priestess sits between two pillars, a black one on her right on which is written the letter B, and a white one on her left with the letter J. The letters B and J stand for Boaz and Jachin. Boaz is roughly translated as “strength,” and Jachin as “stability.” These are the pillars at the entrance to King Solomon’s Temple. Behind her hangs a blue cloth with a pattern of leaves, date palm trees, and cut pomegranate fruit of yellow flesh and red seeds. This fruit with its innumerable red seeds is associated with fertility, which is connected to the horned crescent moon and crown that represent the masculine principle of insemination. The High Priestess intuits and interprets hidden and secret things. She is wise, patient to the point of indecision and stagnation, and discreet to the point of being secretive and even deceptive. You may find yourself walking on eggshells around this person, as they are skilled at making themselves into the victim and pointing fingers at everyone else when things go wrong. Mental illness and personality disorders are common traits when the High Priestess is reversed. In the upright position, The High Priestess is the guardian of the subconscious mind, providing sacred knowledge of hidden mysteries. This card reminds us that the world isn’t always what it seems, and urges us to remain aware of our surroundings. This card could mean that a romantic appointment is being made in secret — a couple is coming together without anyone knowing. It may also mean that a woman is expecting a child to her surprise, or that an unexpected and happy event is soon to occur. If you are in a relationship, you don’t always express your feelings. Both you and your partner are reserved and silent, although neither one of you doubts or distrusts the other. If you date women, you could well be interested in one who is distant and unapproachable. Things are falling into place without you realizing what is happening. New opportunities or the chance of a promotion are developing in secret. Things come to those that wait — be patient, you will eventually get what is your due. In the workplace, your colleagues or your boss confide in you and let you in on some secrets. If you are part of a company or corporation, a long-term project or product is being developed in secret. Money may have been a little tight lately, or not coming in as expected. You’re concerned about your future and financial security, but be careful of who you discuss this with. Keep them on a need-to-know basis. Changes in your environment may be throwing off your system’s fragile balance. Paying attention to your reproductive system’s health will be especially important at this time. There may be some information about your health that has not yet come to light. A full medical check-up will help you understand where the problem is and follow the appropriate course of action. The High Priestess in the reversed position urges you to look inward and trust your instincts. This is a time where you may be tempted to listen to others and follow blindly in their footsteps. Be weary of the herd mentality! While you may find that find people are more inclined than usual to compliment you on your appearance or show interest in your opinions, the High Priestess reversed also indicates that you are out of touch with your emotions. If you are in a relationship, you do not see trouble on the horizon. You are keeping your thoughts to yourselves — one of you may even be hiding an affair or the wish to separate. You bottle up your grudges or you lie and cheat to avoid facing the truth. The air between you and your partner is heavy with silence, indifference and hostility. Passivity in the face of life’s problems makes you powerless. Mysterious and impenetrable factors are preventing you from finding work or evolving professionally. It could be that someone who holds an old grudge against you is causing trouble behind your back and destroying your chance of promotion. There may even be secret discussions of the company closing its doors. If you have been fired or denied a promotion, it is likely that the real reasons for your dismissal are hidden. Before assuming that it’s something personal, ask your boss, as there may be a perfectly good explanation. That being said, trust your instincts if you feel that you’re being fed a lie. Read the fine print when taking out loans and signing contracts. Be prudent — someone may not be telling you everything. Don’t make any type of financial commitment without getting a second opinion. The High Priestess reversed is a call for due diligence. Take medical advice seriously, but don’t hesitate to ask questions and push for further explanations — your health problems are complex and warrant a second opinion. Lifestyle changes may be required. Eat healthy, do more exercise, and take supplements or medication as prescribed. You must also learn how to control your negative emotions. You are subject to mood swings and bouts of irritability. If you are a woman, you may have health issues with your ovaries or uterus. You may also be suffering from gastrointestinal issues. In the past position, the High Priestess is a testament to the patience and understanding you have shown in difficult circumstances. Instinct and intuition have been guiding forces throughout your life, more often than otherwise leading you in the right direction. When this card is in the present position, you’re advised to never believe what’s presented as the truth. The skills you developed in the past will apply here, making it easier for you to avoid bad a situation. Is your partner insisting on you moving in together, despite your objections? Do you sense that someone walking down the street is following you too closely? Follow these hunches — you’ll be grateful that you did. In the future position, the High Priestess means that you’re headed towards a conflict that should be defused or avoided altogether. Use your foresight to guide you to the best outcome. This card is one that knows without knowing — use that ability to better your future. The High Priestess represents intuition and the subconscious mind, and should be interpreted as such in card combinations that call for action or choices to be made. You are acting on your feelings in the absence of trustworthy information. This could be because a manipulative person is trying to sway you in a relationship, or maybe a cunning coworker is trying to outsmart you. Your inner voice will help you navigate these relationships and avoid harm. This is a creative combination that announces the success you’ve been working towards. Don’t let your lack of education or experience discourage you from completing this project, as the results will surprise everyone — even you. The world around you may be threatening, manipulative and self-serving, but this combination reminds you of the strength of your inner voice. Delay your response to any form of subtle aggression — the best strategy is to find your inner peace and anticipate their next move. The High Priestess appears when you are not meant to know the outcome or the action you should take. Therefore, it is neither a yes or no from this card. If you are wondering how a relationship will end, the answer cannot be known at the moment.